In case you missed it, Derek Jeter is retiring. You would have to have been in Yemen for the last six months to not be aware of the six-month retirement party that Major League Baseball threw for Jeter, who is finishing up his 20th year with the New York Yankees. Why is there so much love for Jeter? He’s a Yankee and for millions of people in North America, that is reason enough to hate him. He had a great career but he’s not going to be any Top 25 Players of All Time lists. Maybe he’s beloved by fans and the media because he’s a throwback. Twenty years in the number one media market in the world and the worst you can say about him is that he dated some really, really good looking women. He’s humble and polite, which sets him apart from way too many stars in too many sports. Remember Richard Sherman of the Seattle Seahawks using his live, on-the-field Super Bowl post game interview to pound his chest, look into the camera and declare himself the best cornerback in the world? That got him on Time Magazine’s list of the world’s 100 most influential people. In 2014, over the top is the way to go. 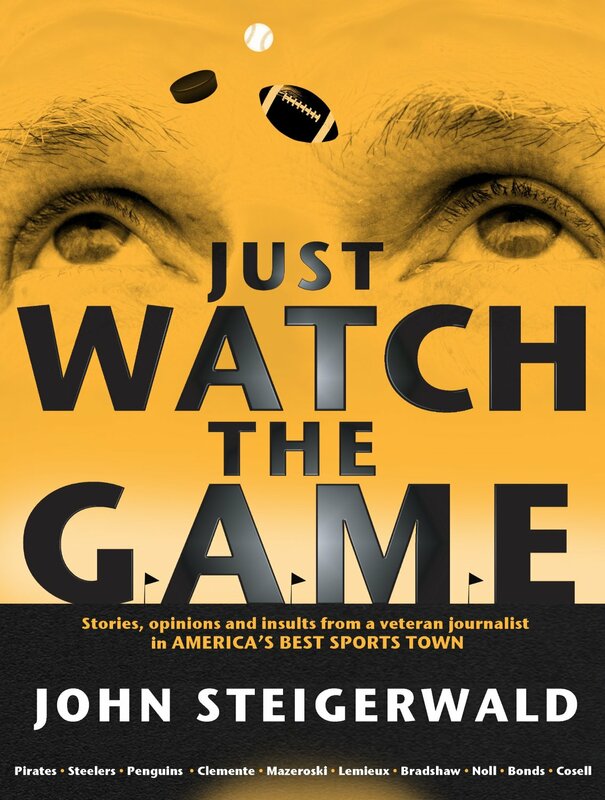 I wrote a book called “Just Watch The Game” a good portion of which is dedicated to pointing out how, in sports today, the game seems to get lost in the surrounding hype and stupidity. Most fans seem to have become fans of being fans. Tailgaters show up at 6 a.m. for games that start at 1 p.m. Grown men dress like boys, wearing the authentic game jersey of their heroes, who are often young enough to be their sons. That, of course, leads to fights, in which grown men wearing opposing jerseys, beat themselves within an inch of their lives. There was a lovely scene at last Sunday’s Cardinals-49ers game in Phoenix, when two guys wearing 49ers jerseys were set upon by decked out Cardinals fans. Maybe you’ve seen the video of them tumbling down the blood-stained, concrete stairs. Jeter’s predecessors on the great Yankees teams of the ‘50s and ‘60s were hated by people in every city they visited. But fans back then seemed to have some perspective, not to mention a dash of maturity. They were there, first and foremost, to just watch the game. They came dressed as regular human beings and didn’t feel obligated to get liquored up for five hours before the first pitch and go looking for someone wearing a Yankees cap to beat up. Of course, the farewell party for Jeter was over the top, but you can’t blame him for that. It’s just the world we live in. That’s why the Pirates pack goggles to wear during the champagne spraying celebration for clinching a wild card spot. Jeter’s a throwback to the time when a team had to, you know, win something before having a champagne party. But why not break out the bubbly and cheapen every pennant- winning celebration that preceded you when the team can sell the bottles for $50? That’s what the empty bottles will be selling for next week. And they will be authenticated by Major League Baseball. If that’s a little too pricey for you, how about a cork for 15 bucks? This is nothing new. Amazon has an empty champagne bottle left over from the Yankees’ 2010 ALDS celebration available for only $160. If you want the cork, you’re on your own. But don’t let anybody tell you that fans are taking this stuff too seriously. Just watch the game, indeed. Florida State’s half-assed attempt at punishing Jameis Wintston is all you need to know. You remember Jameis, last year’s Heisman Trophy winner, who beat the rap on a sexual assault accusation. The prosecutor, William N. Meggs, said that, because of a sloppy police investigation, he didn’t have enough evidence to prove the alleged victim had been raped. The consensus among most observers is that Winston got the star quarterback of the possible National Championship winner treatment. Fast forward to Tuesday and Winston is standing on a table in the Florida State student union yelling – well, never mind what he was yelling. It’s a vulgar phrase that shouldn’t be written here and it’s definitely not something that someone recently accused of sexual assault should be saying out loud in a public place. For that, Florida State head football coach Jimbo Fisher “suspended” Winston for the first half of Saturday’s game against Clemson. One more big opportunity missed by a big time college coach. Fisher had the chance to send an obviously well-needed message to Winston and a powerful message to the rest of his team. He could have – should have – suspended Winston for at least three games. It’s these kinds of missed opportunities that lead to the problems that the NFL has been having the last few weeks. West Virginia coach Dana Holgerson was told by Morgantown police Wednesday that they had a nightclub surveillance video of his best defensive player, cornerback Daryl Worley, putting both his hands on a woman’s throat and throwing her to the ground. Worley was charged with battery and suspended indefinitely, which apparently means more than half a game. Holgerson should have kicked Worley off the team. And when WVU Athletic Director Oliver Luck saw that Holgerson wasn’t willing to get rid of him, he should have stepped in and done it himself. And when WVU President Gordon Gee saw that Luck wasn’t willing to do the right thing, he should have kicked Worley out. The time for second chances is over. Big time college and professional athletes have obviously not been getting the messages that have (or haven’t) been sent to them. Token punishments and empty threats aren’t working anymore if they ever did. And when a player is kicked off for committing a violent crime, other teams need to avoid the temptation to give him that second chance no matter how good he may be. It’s time for college coaches and administrators to start taking preemptive action. When a high school kid proves he can’t stay out of trouble or do college work, don’t offer him a scholarship. Or shut up about how you’re trying to clean up college sports. Pro teams should do what the Philadelphia Eagles did with their All-Pro wide receiver Desean Jackson this Summer after reports surfaced that he was hanging out with gang members in Los Angeles, including two who were suspected of murder. It produced a good bit of whining among the national sports media about how there was no real proof and Jackson hadn’t committed any crimes. That’s exactly the point. That’s what preemptive means. Nip it in the bud. Don’t draft college players who have criminal pasts or criminal friends. NFL owners, like the Ravens’ Steve Bisciotti, who, according to ESPN, knew exactly what Ray Rice did in the elevator that night, have to stop hiding behind the commissioner and pushing for leniency and start doing the right thing. Too bad J. Edgar Hoover wasn’t available. Mr. Hoover is the most famous FBI director of all time and, even though his reputation has taken some hits since he died in 1972, everybody would have been a lot more impressed if he had been called in to investigate the NFL instead of a more recent former director, Robert Mueller. Mueller was called on by NFL commissioner Roger Goodell to investigate, well, Roger Goodell. It seems people are having trouble believing that a company powerful enough to call on a former Director of the FBI to investigate itself couldn’t figure out whether or not its leader had seen a video. The video in question, of course, is the one that shows Ray Rice knocking out his then-fiance. It cost Rice his job and it could end up costing Goodell his. Goodell claims he never saw the video and that, to his knowledge, nobody associated with the NFL had seen it. Call me crazy, but this doesn’t sound like a case worthy of a G-Man who spent most of his career trying to expose al-Quaeda plots. How hard could it be to, by process of elimination, find out whose voice is on the recording and ask her who she was thanking for sending the video? But this is the NFL and image is everything. Except in Charlotte, North Carolina where Greg Hardy was expected to start for the Carolina Panthers against the Detroit Lions on Sunday, despite being convicted of abuse at least as severe as Rice‘s. Hardy’s former girl friend accused him of, among other things, throwing her into a bathtub, slamming a toilet seat on her hand, picking her up and slamming her on a couch full of loaded weapons, choking her and threatening to kill her. A judge heard the testimony and found Hardy guilty and sentenced him to a 60-day suspended sentence and two years probation. Hardy exercised his right to appeal to a trial by jury – a smart move that will save him millions of dollars. He has a 1-year $13 million contract and would be out several million if he had accepted the verdict and been suspended by the NFL. The trial probably won’t happen until after the NFL season is over and he has been paid the full amount. Will you be surprised if Greg drops his appeal after the clock runs out? The NFL is calling Mueller’s efforts “an independent investigation” despite the fact that two team owners, Art Rooney II of the Steelers and John Mara of the Giants, both grandsons of NFL founders, will be providing oversight. Kind of like a fox overseeing a hen house investigation. That’s not to impugn the integrity of either Rooney or Mara but whatever the NFL gains from bringing in J. Edgar…I mean Robert Mueller, is lost by including them. And none if it matters anyway if Greg Hardy plays another game in the NFL this season. As Rooney knows all too well because of the six-game suspension given his quarterback, Ben Roethlisberger, Goodell has suspended players without waiting for formal charges to be filed much less an appeal being heard. Mr. Mueller knows all about finding clues, but he may have met his match with the NFL. The evidence gets stronger every day that it doesn’t have one. It’s about the football team at the Catholic grade school I attended more than 50 years ago. The team lost one game in the 1950s. Winning was important. Football was considered as much a part of a boy’s education as anything learned in the classroom. And nobody apologized for it. The Pastor, Father Lonergan, contributed columns to the weekly church bulletin. I thought the first NFL Sunday was a good time to share this with the Twittersphere. Feel free to retweet it. Football at St. Bernard is not merely a form of recreation; it is much more. There is no place on the football field for the sluggard, the shirker,the leaner, the quitter, the coward, the egotist, the scatterbrain or the dolt. Most of these faults are the result of pampering. In a football game, the opposing team is seldom inclined to do much pampering. Football is just clean, hard give and take. What a training to face the stern realities of life. We have a lot of fine boys in St. Bernard’s School and our aim is to bring out all of the best in them. We saw what football did to the boys last year. The benefit was almost unbelievable. It is a pity that many boys are physically unfit to take part in the training. They are missing something, just on account of their physical handicap, they need most urgently. They are our problems. The real football boy is seldom a problem. He has learned to tackle problems. I know none of that explains Plaxico Burress, but, it was a different time. The value of every statue on the planet took a tumble on Thursday. That’s the day when former Baltimore Ravens linebacker Ray Lewis got his. The Ravens unveiled the statue of Lewis outside of M&T Bank Stadium and it now stands as exhibit “A” of what, in the last few years, has become rampant statue inflation. Remember when statues meant something? How much value would the Lincoln Memorial lose tomorrow if a Bill Clinton Memorial, with a statue the same size, were placed next to it? Johnny Unitas’ statue had stood alone outside the Ravens’ stadium until Thursday. It was unveiled in 2002, long before the statue standard had been lowered. Unitas is considered by millions to be the best quarterback in NFL history. He’s probably Baltimore’s number one sports star of all time, even though he played for a team that eventually sneaked out of town in the middle of the night. Michael Jordan has a statue in Chicago. Stan Musial has one in St. Louis, Bobby Orr in Boston, Bear Bryant in Alabama, Wayne Gretzky has two, one in Edmonton and one in Los Angeles. Cam Newton has one in Auburn, Alabama. He was Auburn University’s quarterback for one year. He won the Heisman Trophy, which is a pretty nice statue in itself, but that is obviously no longer enough. Nick Saban got one in Alabama after four years as the head coach. Statues are popping up everywhere and the more statues there are the less significant each one becomes. Hundreds of people showed up for the unveiling of Lewis’ statue. Jacinth Baker and Richard Lollar weren’t able to make it, though. They’re both still dead. They died on January 31, 2001 and Ray Lewis was charged with their murder. Ray eventually copped a plea to obstruction of a murder investigation in return for his testimony against two of his friends. Reginald Oakley and Joseph Sweeting beat the rap. The blood-soaked, white suit that Lewis wore that night has never been found. Nobody should call you crazy if you believe that Lewis knows who killed Baker and Lollar. For that matter, until the murderer is found, feel free to include Lewis among the suspects. It’s okay to build a statue based on the past, but the murder is old news. Lewis was celebrated by the media as the Ravens’ inspirational leader. Listen to his colleagues at ESPN and you would think he’s Martin Luther King. While nobody would deny his greatness as a player, he will be remembered most for the ridiculous “dance” that he would do before every home game. That’s why the statue outside M & T Bank Stadium captures him in mid-dance, head back, mouth open. They played his entrance song, “Hot in Here” by Nelly at the unveiling. The families of Jacinth Baker and Richard Lollar are still asking for justice. They probably believed they would get that before Ray-Ray got his statue. Here’s hoping the pigeons in Baltimore do their duty early and often.